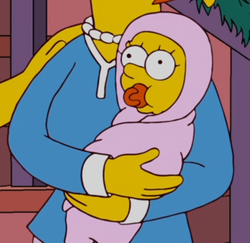 Maggie's daughter is the daughter of Maggie Simpson. Maggie went into labor during a taxi ride home and was taken to hospital. Here she gave birth to her daughter but didn't get a chance to tell who the father was because she was interrupted. A clip of Maggie coming into the house with her child was seen. Modified on December 24, 2018, at 18:30.